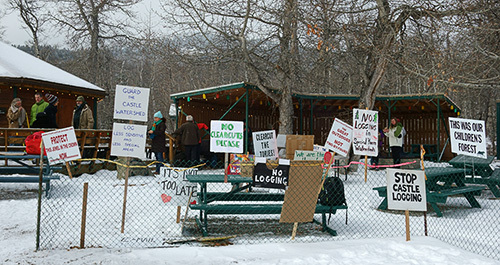 Please join us at a Stop Castle Logging Rally on Sunday, January 20 in Beaver Mines. As many of you will know, Spray Lake Sawmills (SLS) is currently clear-cut logging in the Castle. The provincial government gave SLS permission to complete the first year of logging that was delayed by last winter’s protests. The Castle logging scheduled for years two and three has been put on hold pending the outcome of the South Saskatchewan Regional Plan (SSRP), but it has not been cancelled. We still have work to do. 1. Even though it’s already started, we continue to oppose this year’s logging—we haven’t simply given up and gone away. 2. The logging scheduled for years two and three needs to be permanently cancelled. 3. There needs to be a review of all logging along the eastern slopes. Valley-by-valley protest and conflict is no way to manage our forest resources. Location: Beaver Mines gazebo, in the park directly behind the Beaver Mines store. (Please park on 2nd Avenue so as not to fill the store’s parking lot.) The gazebo has heat, and we’ll have a fire going outside. The rally will proceed regardless of the weather. Timing: Coffee and Hot Chocolate will be on at 11:00 am. Lunch will be provided from about 12:00 noon until 1:00. From about 1:00 to 2:00 pm, we’ll make the short walk to stand with our signs in public areas along the main road running through Beaver Mines (Hwy 774). Entertainment: Sid Marty will be on hand to read some of his poetry, and perhaps play a few tunes. We may also have some other entertainment over lunch. Other info: Please bring your own sign. Be creative, we expect the press to be there. Please respect private property, and stick to public areas. Be respectful of the neighbours, and of the traffic. There are limited toilet facilities, and no running water at the gazebo. RSVP: So we can organize the food, please contact Carolyn at the CCWC office ASAP if you’re planning to have lunch, (403) 627-5059, office@ccwc.ab.ca. Please pass this message on to others who you think may be interested. News Release: Grinch Spotted Near Beaver Mines, Alberta. Forest Begins Disappearing. Grinch Spotted Near Beaver Mines, Alberta. Forest Begins Disappearing. The Grinch has been spotted in several locations in the vicinity of Beaver Mines, AB, southwest of Pincher Creek. 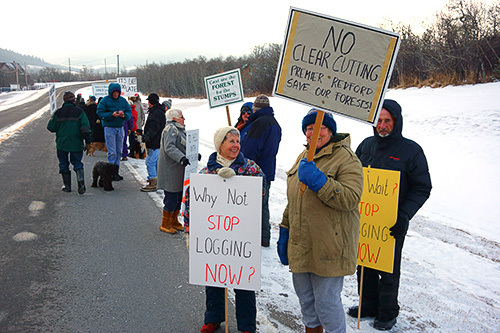 Despite several years of massive public opposition, and protests that eventually led to the arrests of five people last February, Spray Lake Sawmills has begun clear-cutting some 1000 truckloads of logs from the heart of the Castle Special Place. The October 2012 issues of the AWA’s Wildlands Advocate has several articles related to the Castle, and to Castle logging. Castle coverages starts with the striking image on the cover titled The Guardians by Barbara Amos. The image is from a series of photos called Red Alert for the Castle Watershed that are intended to create metaphors about caring for our watersheds. Inside, Peter Sherrington writes about Water in the Castle, while Nigel Douglas discusses the findings of the AWA’s FOIP on the Castle logging in Logging Trumps All Other Concerns in the Castle: Findings from a Freedom of Information Application. The issue’s In Memoriam honours Rick Collier, a long-time friend of the Castle, and a staunch defender of things wild and free. Five individuals who were involved in last winter’s Castle logging protest, plus the Castle-Crown Wilderness Coalition, are taking the Alberta Government to court over the continuing clear-cut logging in the Castle area, southwest of Pincher Creek, AB. For a number of reasons, including the lack of effective consultation, and the fact that the Castle is considered core grizzly bear habitat, the Applicants are arguing that the logging licence is invalid. The case will be heard in the Court of Queen’s Bench on Thursday, November 8, 2012, starting at 10:00 am. (Calgary Courts Centre, 601–5 Street SW, Calgary, AB). The full day has been set aside. Mr. Clint Docken, of Docken & Company, will represent the Applicants. Spokespeople will be available on November 8 for comment. As you may know, five individuals who were involved in last winter’s Castle logging protest, plus the Castle-Crown Wilderness Coalition are taking the Alberta Government to court over the clear-cut logging in the Castle. For a number of reasons, including the lack of effective consultation, and the fact that the Castle is considered core grizzly bear habitat, it is our contention that the logging licence is invalid. We will be arguing our case in the Court of Queen’s Bench on Thursday, November 8, 2012, starting at 10:00 am. (Calgary Courts Centre, 601–5 Street SW, Calgary, AB). The full day has been set aside. Mr. Clint Docken, of Docken & Company, will be representing us. Let others who may be interested know, and then join us in the courtroom on November 8. Carpooling can be coordinated through Carolyn at the CCWC office, (403) 627-5059, office@ccwc.ab.ca. 2. Help us with the legal costs. Cheques made out to the Castle-Crown Wilderness Coalition can be sent to CCWC, Box 2621, Pincher Creek, AB, T0K 1W0. Mark the cheque “For Stop Castle Logging”. Alternately, Donations can be made through Canada Helps http://www.canadahelps.org/CharityProfilePage.aspx?CharityID=s47673. Use the “Donate Now” button. 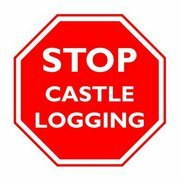 On the next page choose “Stop Castle Logging” from the scroll-down menu. 3. Call or write Premier Redford, Minister McQueen, and your MLA, and let them know that you oppose any further logging in the Castle. See stopcastlelogging.org for contact information.